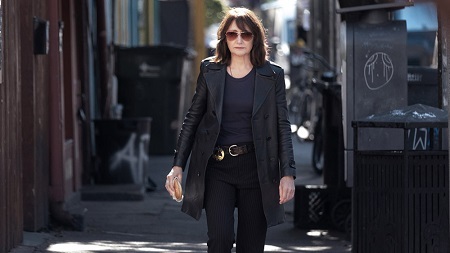 Adapted from Martin Amis’ best-selling novel by director Carol Morley (The Falling), the mystery-thriller Out of Blue is relentlessly frustrating. 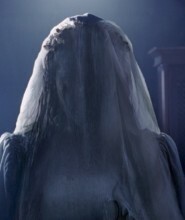 Featuring a strong, undeniably dynamic performance from esteemed, Oscar-nominated character actress Patricia Clarkson (Pieces of April), magnificently shot with moody, gorgeously unbalanced precision by veteran cinematographer Conrad W. Hall (Panic Room), the movie is so visually arresting and so magnetically acted watching it is hardly a chore. But Morely’s script is so purposefully disjointed and indistinct becoming emotionally involved as to whether a murder mystery will be solved and a killer will be brought to justice is incredibly difficult, and by the time events reached their climax I just wasn’t clear what it was I was supposed to be taking away from anything I had just watched. Veteran New Orleans Detective Mike Hoolihan (Clarkson) is known for breaking the toughest cases. Currently she is investigating the apparent murder of socialite astrophysicist and college professor Jennifer Rockwell (Mamie Gummer), the daughter of Vietnam war hero, successful businessman and powerful Louisiana politician Col. Tom Rockwell (James Caan). She was found shot in the head by a .38 caliber handgun in her university’s observatory, and considering the volume of evidence left at the scene Hoolihan is not lacking for suspects. The detective’s immediate attention falls on two of Jennifer’s closest colleagues, fellow professor Prof. Ian Strammi (Toby Jones), who harbored a secret crush on her, and graduate student Duncan Reynolds (Jonathan Majors), with whom she was in a passionate romantic relationship. But little involving this case is as it initially appears to be. The entire Rockwell family, including the colonel’s wife Miriam (Jacki Weaver) as well as their two sons Walt (Brad Mann) and Bray (Todd Mann), seems to be hiding information that might be vital to the case, while local television news reporter Janey McBride (Yolanda Ross) has way more insight into what happened to Jennifer than she by all rights should have access to. It’s a giant conundrum made all the more confusing by this case’s apparent linkage to a series of unsolved killings of blonde-haired young women shot by a .38 caliber handgun roughly three decades ago, all of this triggering Hoolihan to question everything she knows about police work while forcing her to doubt her own sanity and grasp on tactile reality. The entire relationship between Hoolihan and McBride is odd to say the least. I’m pretty certain I understand the nature of it, that I get what is going on between them. Morely keeps things so intensely abstruse I couldn’t help but get exasperated by the ephemeral nature of their appearances together and the questioning give-and-take that fuels their conversations. It’s all just too vague, and while I’m all for leaving as much as possible up to the audience to decipher for themselves, at a certain point a little clarity, just a tiny bit, would have been welcome. Granted, in large part thanks to the constant aura of psychological instability that Morely goes out of her way to create and few of the supporting players are given ample opportunity and freedom to go in a variety of bonkers directions as far as it pertains to their respective performances. Caan appears to be relishing every second he’s on screen, his bellicose belligerence adding a level of angry menace that slowly begins to leach onto each cell of the film’s narrative DNA as if it were a virus out to destroy all it comes in contact with. As for Weaver, her whack-a-doo eccentricity is a sight to behold. As events progress the two-time Oscar nominee heads to a level of excited peculiarity that’s bizarre, and while I can’t say this is a good thing I can state it gives the actress’ performance an unforgettable kookiness that in its own idiosyncratic way is kind of spectacular. I will say that having the potential murder victim be an esteemed astrophysicist is far more essential to the overall tone and thematic momentum of the story than I initially anticipated it was going to be, and it’s quite possible I got somewhat lost amidst all of the scientifically theoretical psychological gobbledygook. But the end of the movie does have an intense transient power that admittedly held me spellbound, and while I’m not sure enough of the narrative’s various plot strands are comfortably resolved I still couldn’t take my eyes off the screen nonetheless. Clarkson’s marvelously constrained performance goes a long way towards augmenting all of that, while Morely’s confident direction leads me to believe everything ends up exactly as the filmmaker intended, and it is almost as if she could care less if I or anyone else was happy about that. 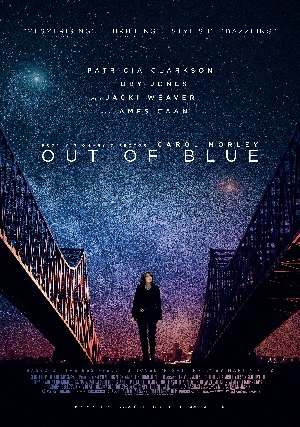 Out of Blue is something imaginative and unique even as it traverses some fairly rudimentary determined cop murder mystery thriller terrain. Whether this is a positive or a negative I cannot say. But it does make the movie hard to forget and even more difficult to dismiss, Morely’s latest a curiously imprecise enigma I’m going to be thinking about for quite some time to come.